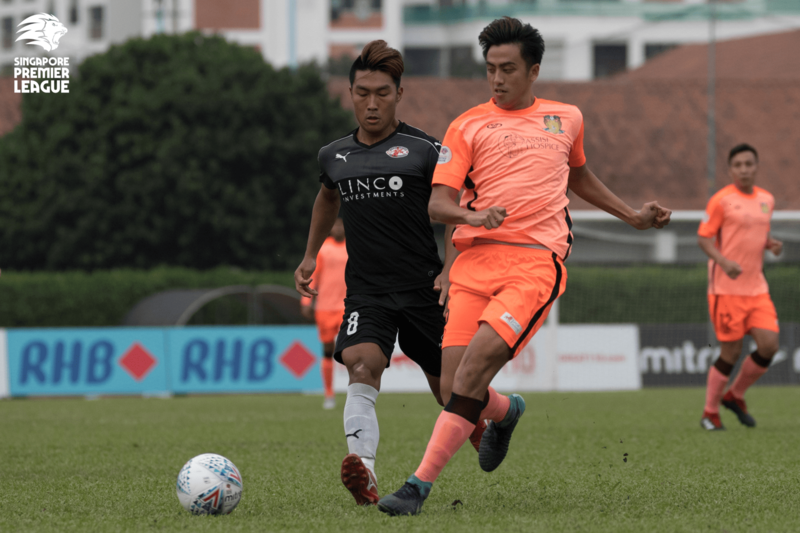 Hougang needed a win to keep up their hopes of overhauling eighth-placed Geylang International FC in the Great Eastern-Hyundai Singapore Premier League (SPL), but were unable to overpower Home after Shahfiq Ghani’s second-half free-kick cancelled out Hafiz Nor’s first-half opener. The Cheetahs wasted a series of gilt-edged chances before Song struck his 16th goal in all competitions six minutes from time to seal all three points for the visitors. Despite missing four key players in Syahiran Miswan, Fareez Farhan and Muhaimin Suhaimi and Iqbal Hussain due to suspension and injury, Hougang were the better side in the opening half-hour. Nurhilmi Jasni saw his free kick from just outside the area denied by Home stand-in custodian Kenji Rusydi on 23 minutes, before Fazrul Nawaz lashed wide of the right-hand post with just Kenji to beat two minutes later. Just like many games throughout the season, the Cheetahs were made to pay for their profligacy as Home went on to open the scoring on 34 minutes. Their plan to spring the offside trap on Shakir Hamzah’s deep cross failed terribly, as Hafiz was onto the ball in a flash before slotting coolly beyond onrushing goalkeeper Khairulhin Khalid. That was the 30-year-old’s eighth goal in all competitions this season as he continued to stake his claim for a Singapore call-up. Going into half-time 1-0 down, Hougang rallied after the break and duly levelled matters on 62 minutes. With Kenji adjudged to have handled just outside the area, substitute Shahfiq curled a stunning dead ball into the top right corner – just eight minutes after coming on – for his first goal in Cheetahs colours. Clement Teo’s men dominated proceedings thereafter, but were unable to find the vital second goal. On 66 minutes, Fazrul was unable to connect from a yard out to finish off Nurhilmi’s header from Chang Jo-yoon’s cross. Two minutes later, history repeated itself as Chang somehow failed to turn in Antoine Viterale’s header off Fazrul’s cross from mere centimetres away. Fazrul then nodded wide from Shahfiq’s free kick in the 78th minute before they finally found the back of the net a minute later. Chang slotted past Kenji from close range after being unselfishly set up by substitute Stanely Ng, but his celebrations were cut short by the offside flag. Home would show them how it should be done by retaking the lead against the run of play on 83 minutes. Substitute Amy Recha’s inswinging corner was flicked onto the path of Song, who met the leather with an emphatic header at the back post to put the Protectors 2-1 up. It was a lead that they never relinquished despite some late pressure from Hougang as they held on for the three points to stay level with second-placed Tampines Rovers FC. Home will take confidence from this result as they face Tampines away in the second leg of their RHB Singapore Cup semi-final tie next Wednesday, while Hougang will face champions Albirex Niigata FC (S) away in the SPL next Sunday. Hougang Caretaker Head Coach Clement Teo: “Of course I’m sad that we didn’t even get a draw. I just don’t know what’s wrong, but this is football… We kept creating but cannot score the goals. We’ve been working on finishing all week, but we don’t put it in when it comes to games. Home Head Coach Aidil Sharin: “We really need this result after coming back from the AFC Cup. These three points mean we are in the AFC Cup for sure for next season, so congratulations to my boys. Hougang: Khairulhin Khalid (GK), Nazrul Nazari, Illyas Lee, Faiz Salleh, Jordan Vestering, Antoine Viterale (Stanely Ng 72’), Fabian Kwok, Nurhilmi Jasni (C), Amir Zalani (Shahfiq Ghani 54’), Chang Jo-yoon (Syukri Bashir 88’), Fazrul Nawaz. Unused subs: Zulfairuuz Rudy (GK), Ridhuan Barudin (GK), Ashrul Syafeeq, Nikesh Singh. Home: Kenji Rusydi (GK), Faritz Hameed, Abdil Qaiyyim, Faizal Roslan, Shakir Hamzah, Izzdin Shafiq (C), Isaka Cernak, Hafiz Nor (M. Anumanthan 82’), Song Uiyoung, Iqram Rifqi (Amy Recha 74’), Shahril Ishak (Christopher Van Huizen 89’). Unused subs: Eko Pradana Putra (GK), Amiruldin Asraf, Fazli Ayob, Shahrin Saberin.